You, dear reader, look like the kind of person who never wants to sleep again, perhaps because it’s time consuming and counterproductive. For that reason, we come to you with news: You won’t ever have to again, because as soon as you close your eyes, this image will be all you see, every time. Perhaps go buy some eyedrops, too, since you may not blink much anymore. This image, as you might have been able to tell in the gif above—you know, if you managed to pry your eyes away from the fact that a man’s head is directly in the path of a vinyl pie hole, or the fact that the photo is so large you can see facial pores—is being adhered to a Ford Mustang race car. 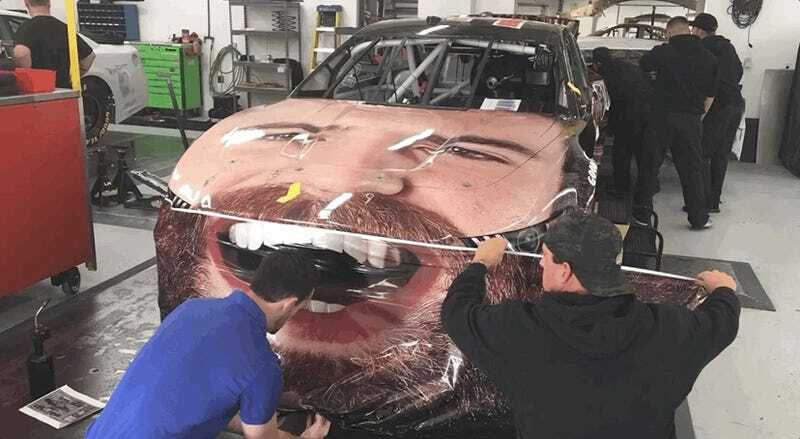 That car will compete in NASCAR’s biggest event, the Daytona 500, later this month, with the hairy man on the hood also acting as the hairy man behind the steering wheel, in what will likely be a very hairy race. It’s almost poetic—you know, if you manage to pry your eyes away from, well, everything. Monster Energy NASCAR Cup Series team Go Fas Racing, a name that makes an ideal pairing with this race car, posted a photo of the livery going onto the car on Wednesday. Corey LaJoie will drive it and star on it, thanks to an Old Spice sponsorship that only identifies itself as an Old Spice sponsorship on the sides of the car. And while those sides might look like your new hardwood floors at first glance, they’re hair, like the entire rest of the paint scheme is. Look at the bright side of all of this. Sure, right now, you’re terrified. You’re leaning back in your office chair, half of your face in a grimace and the other half in an indescribable contortion of confusion. But come tonight, when you would be going to bed, you’ll instead get to finish all of those reports you didn’t get a chance to do at work or start on that book you’ve always wanted to write. The possibilities will be endless.